Santa Claus and Rudolph: New Plans and Directions? Link here for more copies of these photos. December 18, 2014: Fifty members of the Broadmead Runners arrived at Santa’s Workshop to have their annual photo taken. (Double Click Photos to Open to Full Size) (Scroll down to Christmas 2013 for the last year group). The original small group of Runners (about 10) first appeared in 2011. Link Here Christmas 2011 (and scroll down through photos to #9 and #10 for a few comments on two different groups that arrived that year. 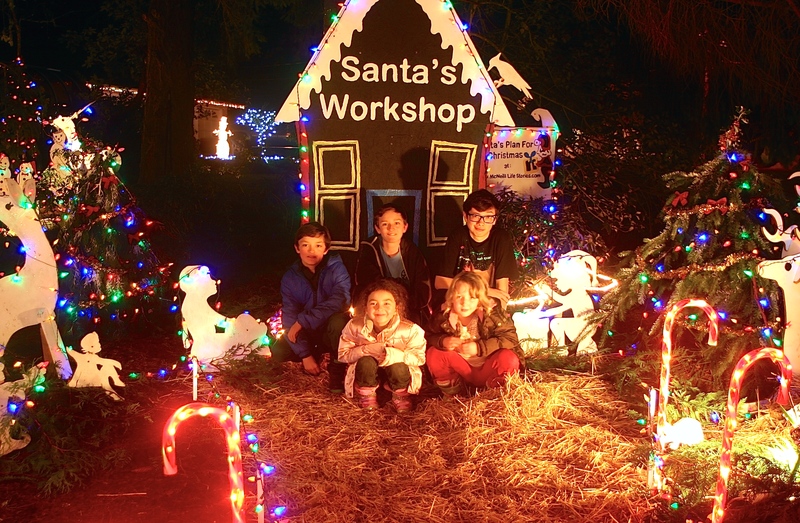 December 6, 2014: The first kids of the season take a trip down Candy Cane Lane to Santa’s Workshop.s: Above: Alex, Kyle, Kenyon, Jasmine and Sophia, grandchildren of Julie Anne Coles. 4402 Leney Place is #18 on the List. Lights on 4:30 – 9:30 pm until December 20th, then extended until 10:30 pm through the rest of the season. December 6, 2014. Another year has rolled by and over the past few weeks Santa and his helpers were busy preparing for Christmas. 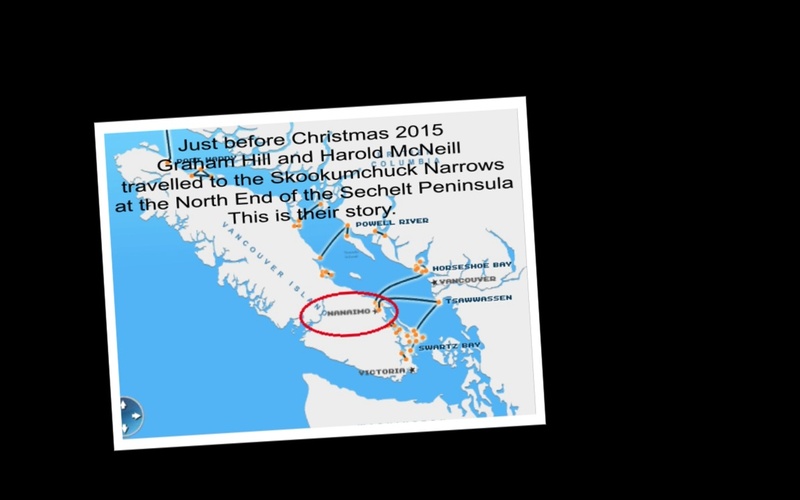 As outlined last year, Ruby, Rudolph’s daughter, will lead the Southern Team from their Leney Place base, while Rudolph Junior, moves to the North Pole base (see New Plans and Directions on the Blog Post at McNeill Life Stories – the lead story until Christmas). While Rudolph has stopped flying on a regular basis, he and his wife are both very proud that their son and daughter who, last year, took over as lead Pilot/Navigator on the two teams of reindeer. When you arrive at Leney Place (Royal Oak of Viewmont and Viaduct Avenue East) please feel free to mosey around by following the straw paths to the various scenes. 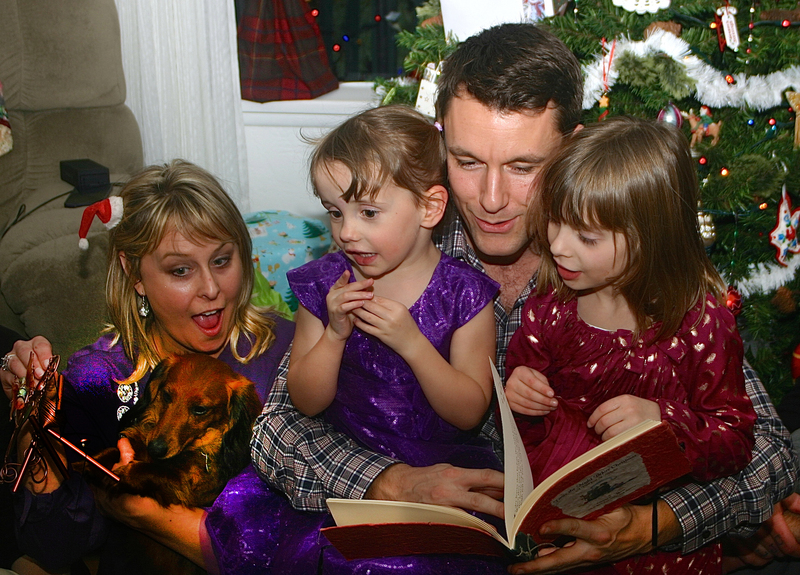 There are several spots to get a good with the family. Please stay on or near the straw paths. When taking the path to Santa’s Sleigh and the Snowman Family from his workshop, you can return to the path behind Joy and Noel. For Joy and Noel, If your photographer stands on the driveway, you can get a nice shot with the two deer (see the photo links on the blog for samples from last year). As you wander down Candy Cane Lane to Santa’s Workshop and along the other straw path keep an eye out for several smaller animals, birds and figurines waiting to greet you. Many have weird shapes as they have come in from other planets to see how Santa runs his gift giving business. An Outdoor Movie Night is being planned for Sunday, December 21, 2013 (weather permitting). Drop by for a Hot chocolate by the fire as we watch a Disney Christmas Movie under the stars (see, the weather will be great). Gifts and Dry Goods: When visiting, the metal container by the entrance to Santa’s Workshop is being used to collect items for needy families. Items collected will be delivered to local agencies before Christmas. PS: Check out the full story and photos on the Web at McNeill Life Stories. Santa and Rudolf will be the lead story until Christmas. If you enjoyed the story and scene, please send a note to Santa and Rudolph via the Comments Section. Continue below for the rest of the story….. While this post was written a month earlier, with the slideshow now complete it is time to go live. 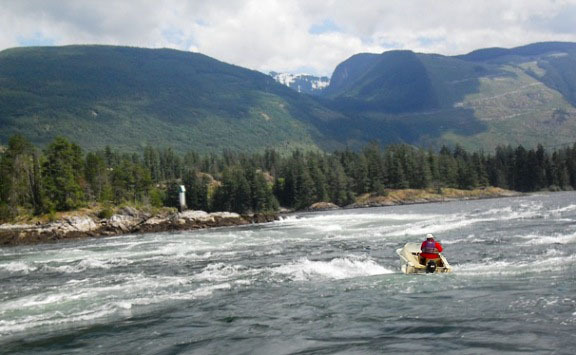 Rather than putting the slideshow at the end, it will be used as an introduction in an attempt to capture the spirit of the trip. It was an amazing time, one I shall always cherish as it seems demands of life have conspired against finding that one-on-one time that only a trip like this can provide. Graham, you are an exceptional man, an easy conversationalist and your depth of knowledge on so many subjects are inspiring. Also, as you will no doubt agree, we have not only been gifted with the most amazing life partners, we also have a string of children, grandchildren and many friends who bring endless joy to our lives as we have moved along each successive stage. We could not have scripted our lives for a better result. As for the following travel story, while I did not take any notes I hope that most of the family facts about your earlier life are correct and as for the make-believe stuff, that is simply a couple of old guys who remain daydream believers. In preparing the final slideshow, the two of you will notice that I have plucked a dozen photographs from your respective Facebook pages in order to add flavour. Later, I will post all the photos on the open access McNeill Life Stories Facebook Page so individual copies can be accessed at leisure. In closing, many thanks to Herb Craig and Ann Skeltcher for their overnight hospitality on that lonely stretch of highway that leads to the hinterlands of the Sechelt Peninsula. There is nothing like good friends, a hot meal, glass of wine and a warm bed to take away the sting out of a hard day on the trail. 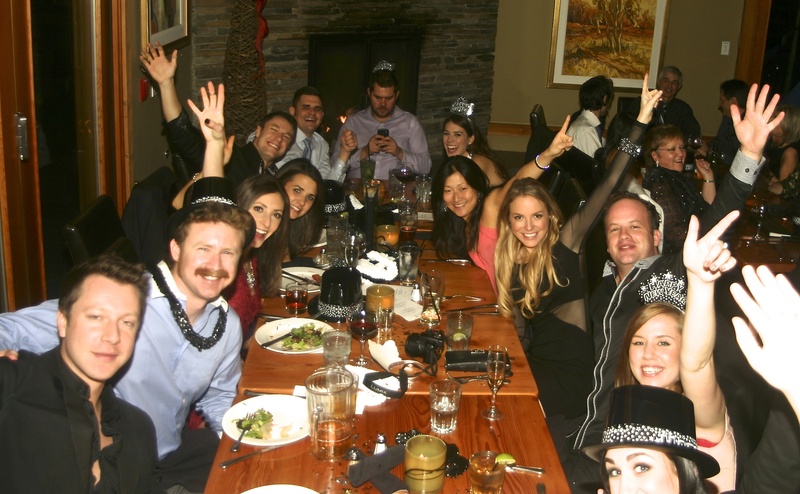 Individual photos of the Christmas Adventure now posted. December, 2015. Crash Scene (AP File Photo) Before anyone panics and begins speculating about what caused the crash on Leney Place last week, please read the following information outlined in another version of The Night Before Christmas. It provides a few answers that should alleviate your immediate concerns. Some think it was pilot error (as usual), but it seems the weather played a large roll. 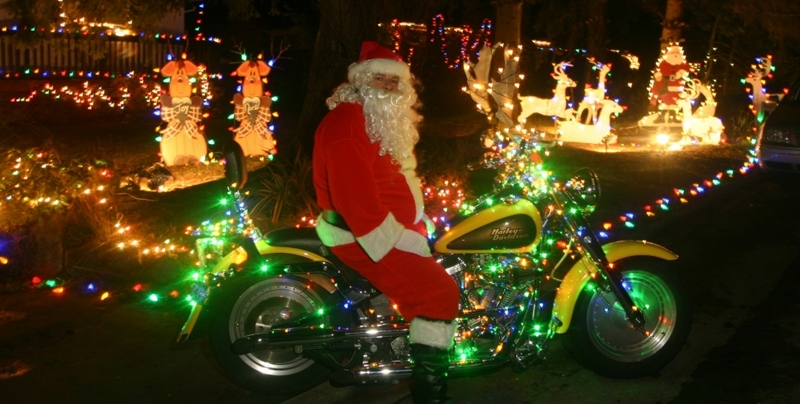 Well, we caught Santa making his rounds last night on his recently refurbished Harley Davidson (click photo to open). On closer inspection, this guy looked suspiciously like our neighbour Ted, but we could not be sure. In any case, it was very nice of him to stop and spend a few minutes and chat. Seems he was curious as to why we had so many reindeer and elves running around our property among all the Christmas lights. 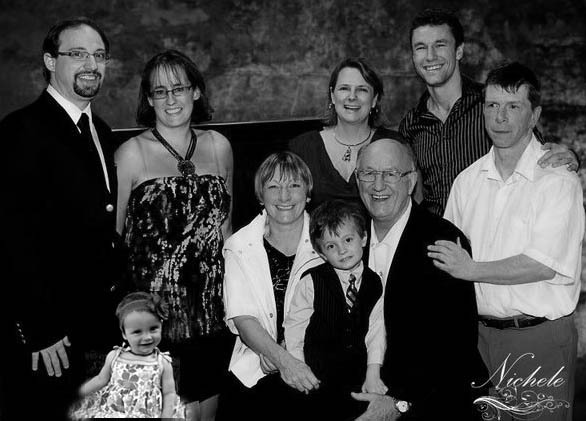 Photo Courtesy of Nichele Studios (L to R) Chris, Audrey and Christine LeClair, Lynn McNeill, Kari Walker, Grayson Walker and Harold McNeill, Sean McNeill and Jay McNeill. Now we challenge you to figure out what is different in this picture from the original? 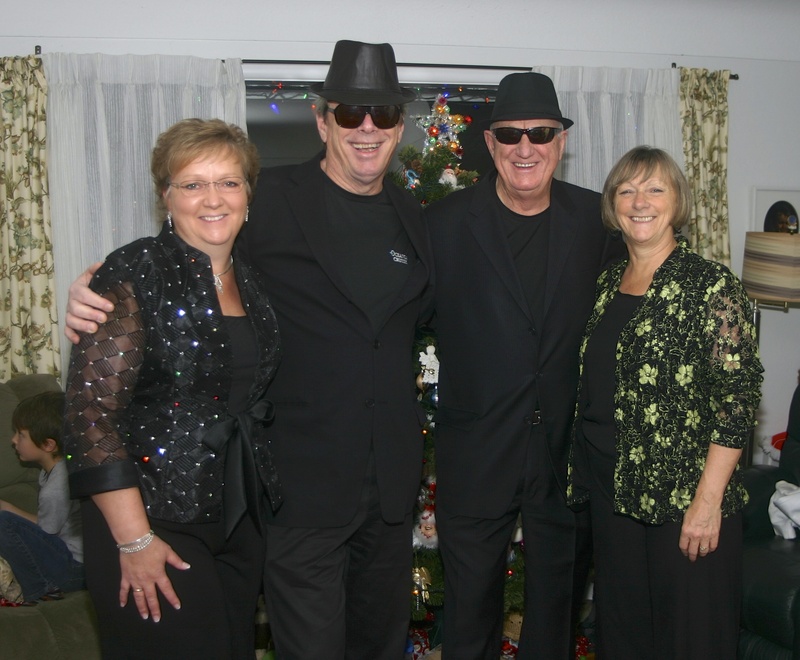 It was a great evening of family, friends, fun, food, music and entertainment at the Brentwood Inn as we bid farewell to that wonderful year of 2012 and welcomed with open arms a 2013 that promises to bring just as many new challenges and opportunities as did 2012. You can rest assured we worked very hard to make the transition as lively as possible. 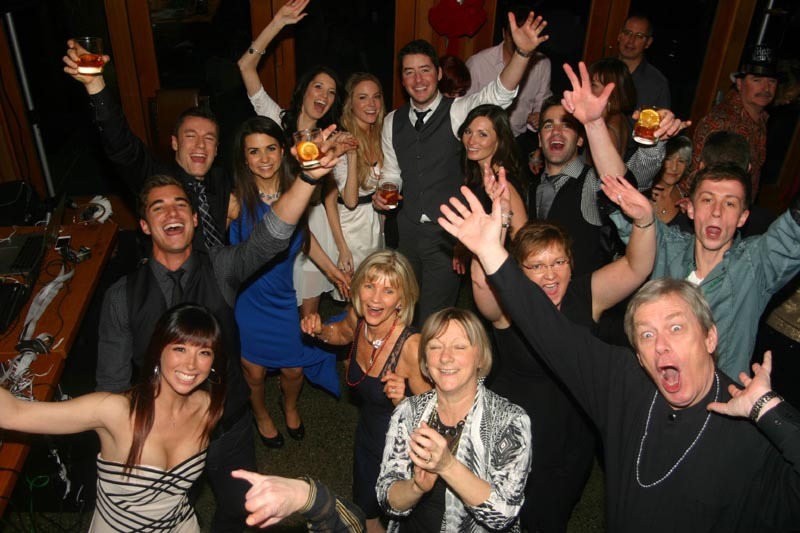 The Staff at the Inn did an amazing job of keeping the crowd well supplied with food and drink while LJC on his non-stop turn-table brought the best of the best in music that kept the dance floor filled. His late evening rap song was a huge hit and demonstrated again just how versatile that young man is. As added bonuses, Drew thrilled the crowd with his jazzed up Sax and Joel put on a break-dance display that was beyond impossible. Two hours later his friends were still trying to untangle the mass of legs and arms. 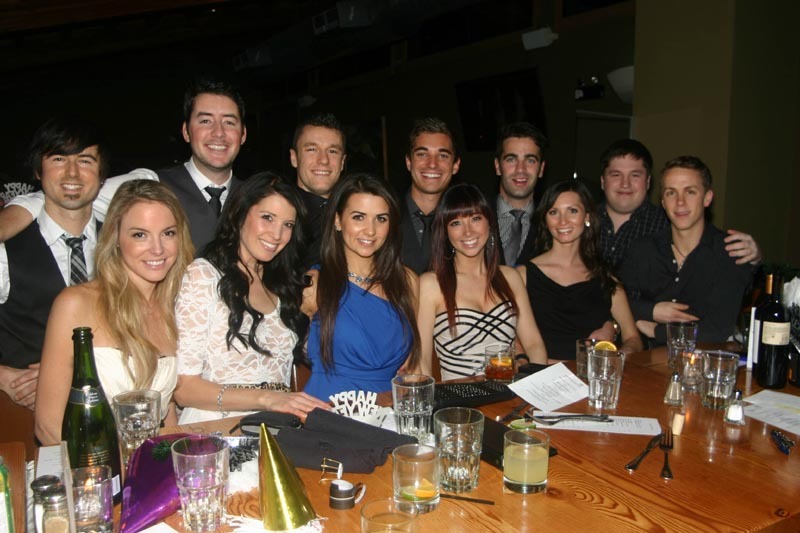 It was a great mix of young, the not so young and dozens of inbetweeners who shared in the evening of merriment. Thanks to Sean and the crew for inviting us. 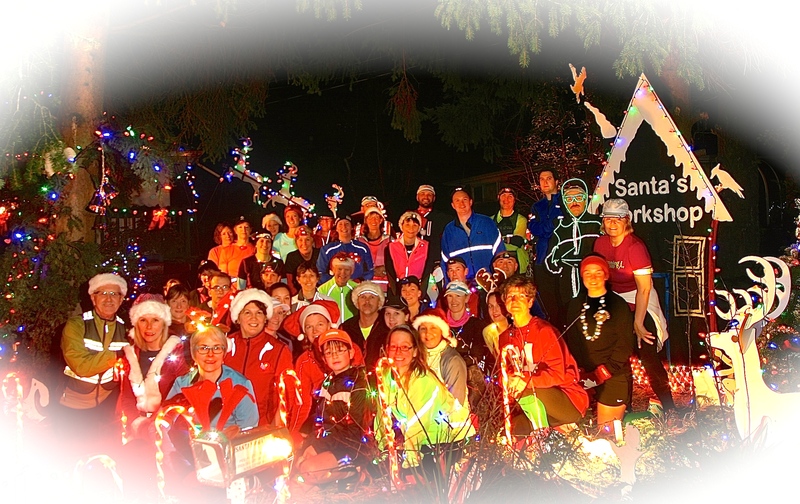 The Broadmead Runners popped by to have their picture taken with Santa and his reindeer. 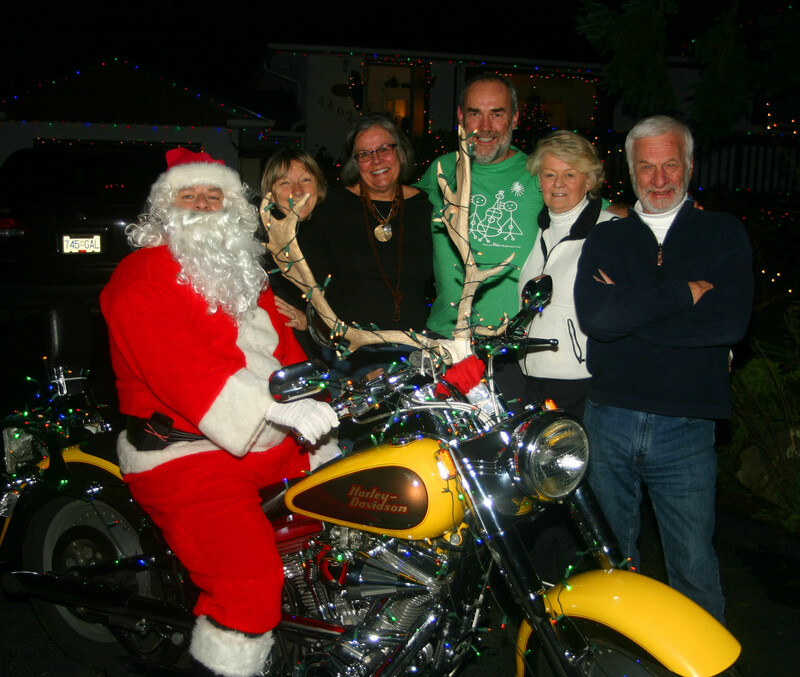 Lynn McNeill, Dianne Mcneill, Michel Payeur, Linda and Bjorn Simonsen get up close and personal with Mr. Claus. 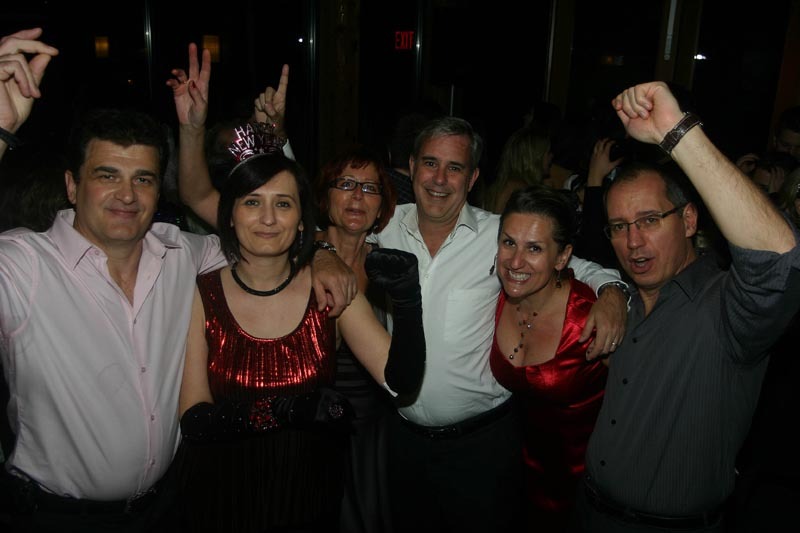 A friend we have not met since the World Cup 2007, Sinisha Ivaz (far right), family and friends. 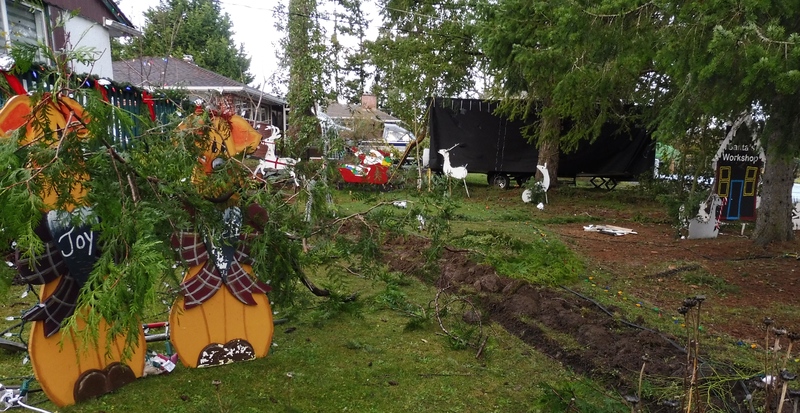 Decorating for Christmas is just plain fun but when friends and neighbors get together to make it a collaborative experience, it gives a whole new meaning to the Season of Joy. 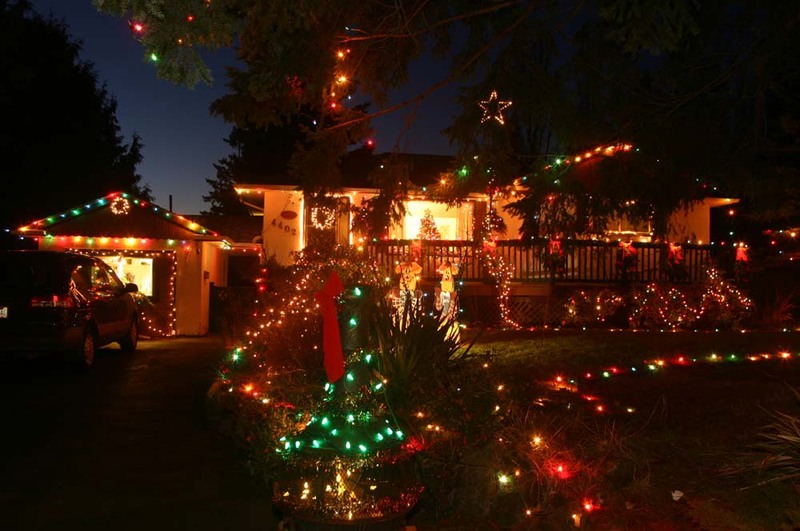 It all began in early December as a result of encouragement coming from Sam and Jacob, two ROMS students, and their dad, who thought it would be a great idea to enter our street in the Times Colonist Lighting Contest. Our two families have been in a bit of a lighting contest for the past couple of years and so decided to combine our efforts. We checked with the other neighbours and after finding everyone was on board, the decorating began in earnest.